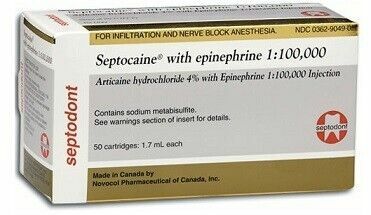 Septocaine 4% with Epinepherine 1: 100,000 Injection. Preferred during operative or surgical procedures when improved visualization of the surgical field is desirable. • Fast onset - 1 to 9 minutes to avoid delay before effective analgesia is achieved. • Predictable duration of anesthesia: up to 60 minutes for infiltration injections and 120 minutes for nerve blocks. • No-methylparaben formulation to avoid allergic reactions on sensitive patients. • 100 percent latex free components to help reduce allergic responses.